This time of year is my favorite time of year to play –and eat – and drink – at the beach. Just when I start thinking, Hey! alright, it’s September, fall’s coming soon… then BAM! I leave the cool confines of my AC’d apartment and quickly remember that, in Jacksonville, summer lasts until November. So. I’m infinitely grateful for the ocean breezes that, like most of my friends who live at the beach, never seem to venture further inland than the intracoastal. Lucky for me I’m not a geographic elitist. 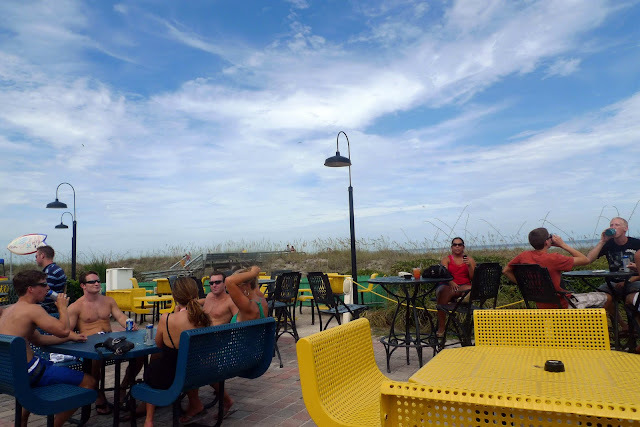 I may not be one for sand and surf, but I do love the laid-back, no-worries vibe found at many restaurants and eateries near Jacksonville’s coast. Here’s an overview of my favorite breezy, beachy restaurants and bars in Jacksonville Beach, Atlantic Beach, and Neptune Beach. Salt Life is a singular lifestyle brand that is trying its very best to singlehandedly embody Jacksonville’s beach culture… and I have to say, they’re doing a pretty good job. T-shirts, bumper stickers, koozies – you see them all over the place. 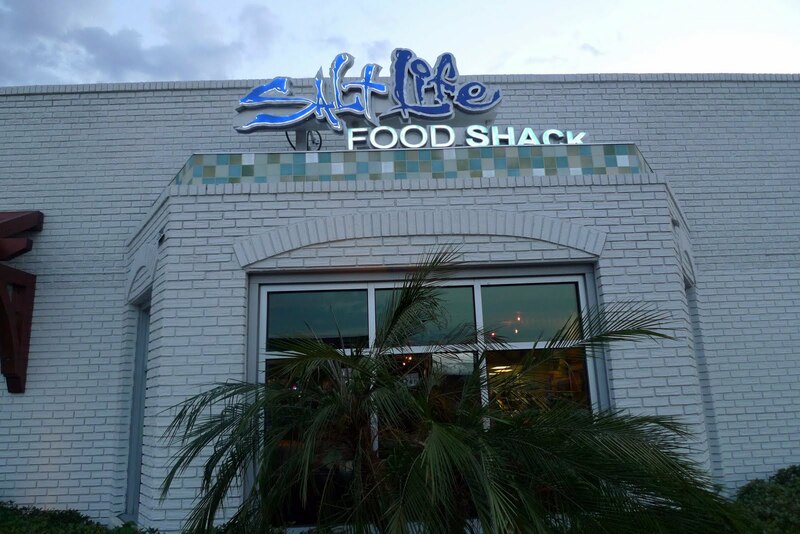 Salt Life Food Shack is a relatively recent addition to the brand and to the Jax Beach dining scene. It occupies the spot where Harry's used to be for years, but they've knocked down all the inside walls to make a huge, bright, airy, oceany open space, with the main dining area separated from a bar area simply by a huge aquarium. The brick walls have all been painted white or sky blue and the ceilings were left exposed. 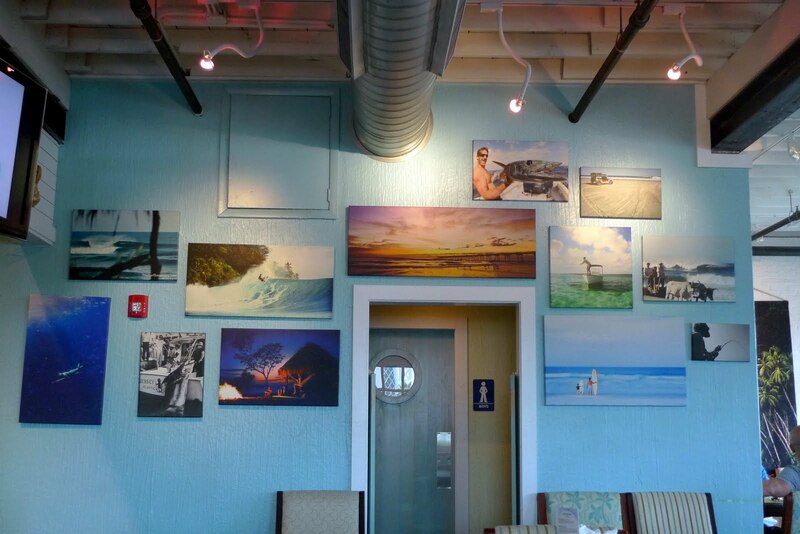 There are all these cool montages of beach life paintings hung on the walls. Plus they created a covered outdoor patio. Harry's was so dark and claustrophobic - Salt Life is the total opposite of that. You get a beach vibe the second you step into Salt Life, and that oceany feel carries over to the menu. Seafood is the name of the game, although they do have a rockin' beer can chicken which I'll tell you more about in a sec. There's a raw bar and sushi section, and a bunch of salads, sandwiches, and seafood entrees. Lots of simple preparations to highlight the freshness of the ingredients. All the waitresses I saw were young and bubbly and gorgeous and ours was extremely competent and friendly, so double score for that. To be honest, I really wanted to hate this place before I ate there. 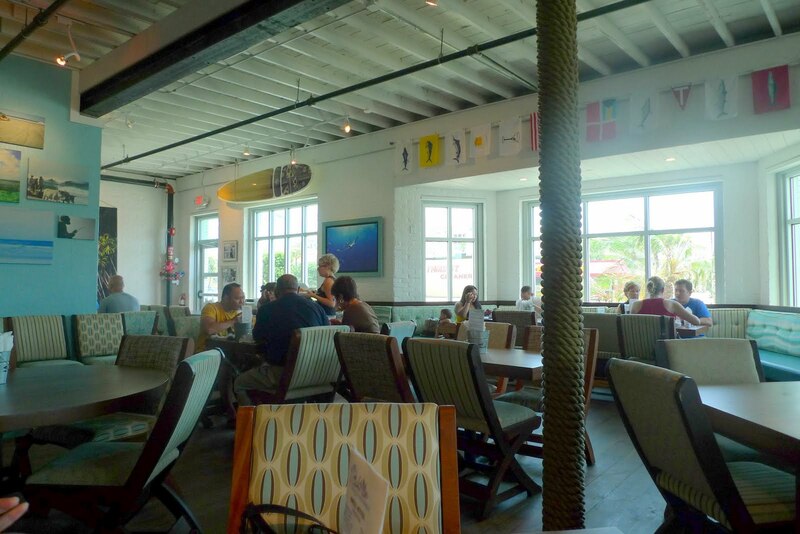 I had tried to do dinner at Salt Life twice before sitting down to lunch but never made it inside due to hour and a half waits on Friday and Saturday nights. !! The eatery was crawling with tan, cutesie beach people both times. Blech. Plus, the whole concept is so cha. A restaurant piggybacking off the cheesy Salt Life bumper sticker craze? I was thinking the place would be all like, Duuuuude, Salt Life isn't a restaurant, it's a state of miiiiiiind, bro. I mean, I even hate the font they use for that Salt Life stuff. But my experience wasn't like that at all. I had been hearing about this poke bowl from seemingly every person who lives out at the beach so I definitely had to try and it see what all the buzz was about. A friend had given me a really hot tip: order the Hawaiian Shrimp Bowl, but substitute ahi tuna for the shrimp. Boy was she right - when the waitress brought me the dish she said all the cooks in the kitchen were really excited about it. And so was I! A big bowl of sticky Japanese-style short grain rice topped with diced, stir-fried squash, zucchini, onions, red bell peppers, and pineapple all cooked in a ginger-soy glaze, then topped with spinach, avocado, and raw ahi tuna slices sprinkled with sesame seeds. All the ingredients were so fresh and the rice was perfectly cooked and they served it with chopsticks and it was just so darn good. It was filling without being at all heavy and I can't tell you how much it hit the spot. One of my girlfriends ordered the beer can chicken. 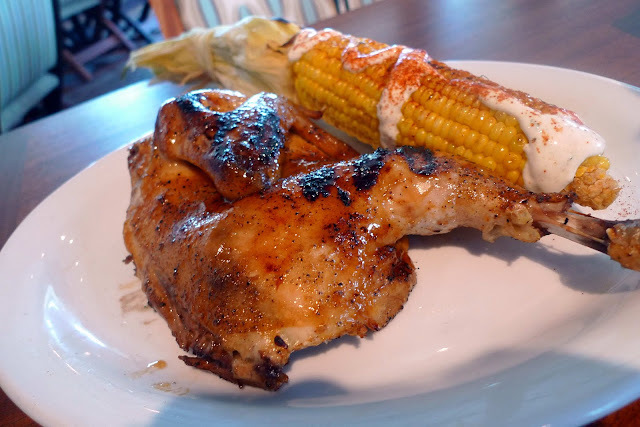 Salt Life offers daily specials and beer can chicken was up for Sunday. The chicken was ridiculously tender and had a glaze on the outside that made the skin salty and flavorful. It was served with an ear of grilled corn with a spicy mayo dressing drizzled on top. A really hearty and well-prepared meal for just nine bucks. She took half of it home. My other friend got the East Coast shrimp roll: poached shrimp tossed in a light mayonnaise dressing with celery in a toasted roll. The shrimp salad was refreshing and the light dressing allowed the flavor of the shrimp to really come through. However, we really could have done without the melted cheese on top of the roll. If I were you, I'd ask for no cheese - unnecessary and not traditional. The roll came with thick seasoned fries. This is a hip place that attracts a fun crowd. When you enter Mellow Mushroom you immediately notice the retro-funk décor and psychedelic motif. They have a decent selection of domestic and import brews on tap. 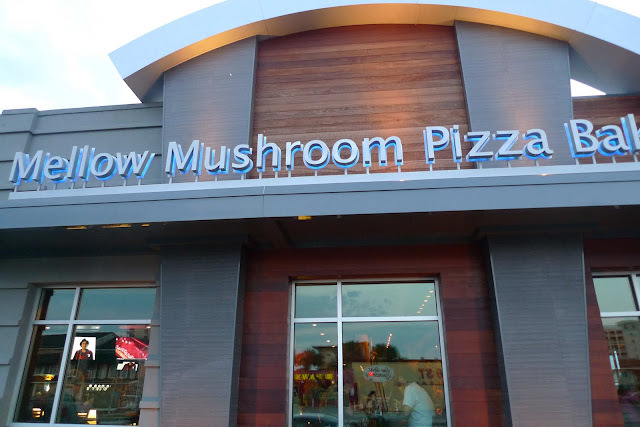 The menu ranges from standard to experimental, as the creative mindset of the restaurant's owners steers Mellow Mushroom in directions that make this place different from all the other pizza houses in town. You'll see lots of hippie-inspired pizza names like Kosmic Karma, Magical Mystery Tour, and the Philosopher, and this vibe and sense of humor extend to all aspects of dining at the Mellow Mushroom. 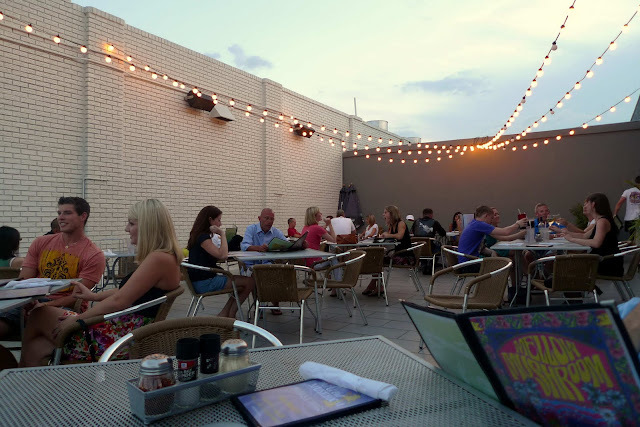 I’d recommend dining outside on Mellow Mushroom's patio if the weather is cooperating. You get breezes out here at the beach that don’t reach us city dwellers, and the tone is relaxed – dare I say, mellow? – with lights casually strung about overhead and lots of sunburnt, rowdy young people hanging out in large groups. I've never come here for the bar scene before, but the giant bar inside the restaurant combined with the festive mood on the patio made me think it would be a fun night. Plus, they have a pretty decent selection of bottled and draft brews. I really like the pizza here, and according to my beach-residing friends it competes for the unofficial title of best slice in town. Last time I visited my date ordered a 10" pizza with some pretty standard toppings - pepperoni, green peppers, extra cheese. I had a slice and we both agreed that the crust at Mellow Mushroom is some of the best in town - it holds up well to the toppings and the thick outer border was chewy and almost had a sourdough-like tang. I was glad we ordered extra cheese and I'll do the same when I return. My dish was less successful, mostly because it was cold when it was supposed to be hot. Serves me right for ordering something semi-healthy at a pizza joint. I got the portobello mushroom stuffed with artichoke hearts, sun-dried tomatoes, feta and spinach… topped with mozzarella, baked in the oven and served over a salad. It was an appetizer dish, so we speculated that they threw it in the oven thinking we wanted it to come out before the pizza, then it just sat around until the pizza was done. It had potential, though. But it needed more artichokes. The service was really slow outside on the deck because it was so busy, so don't expect to come here for a quick meal on the weekends. Our waitress was really nice and she was doing her best - it was just packed. But hey - it's still way better than the two hour wait next door at Salt Life! 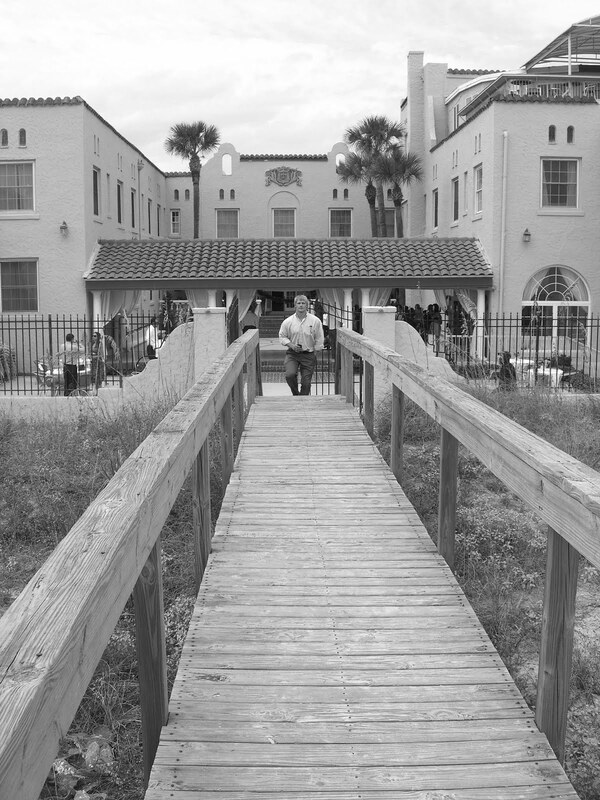 1018 3rd Street North, Jacksonville Beach. (904) 372-4456. 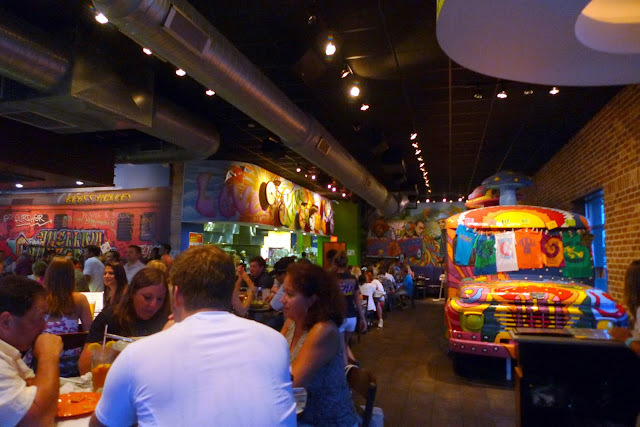 Tacolu is another fun, casual, energetic place out at the beach. On the weekends it’s always crawling with taco-hungry folks willing to wait up to an hour for a table. Luckily Tacolu has a happenin’ bar area and the best tequila selection in town to help bide the time. 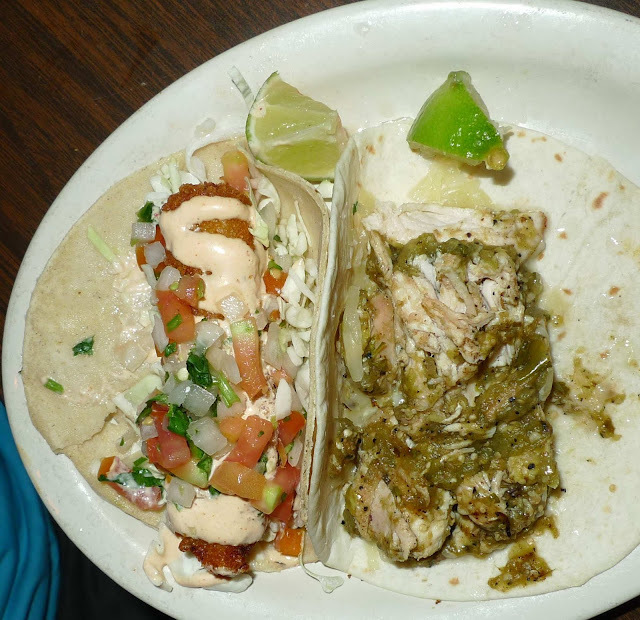 The restaurant bills itself as serving Baja-style tacos, and that’s what I always get when I go. 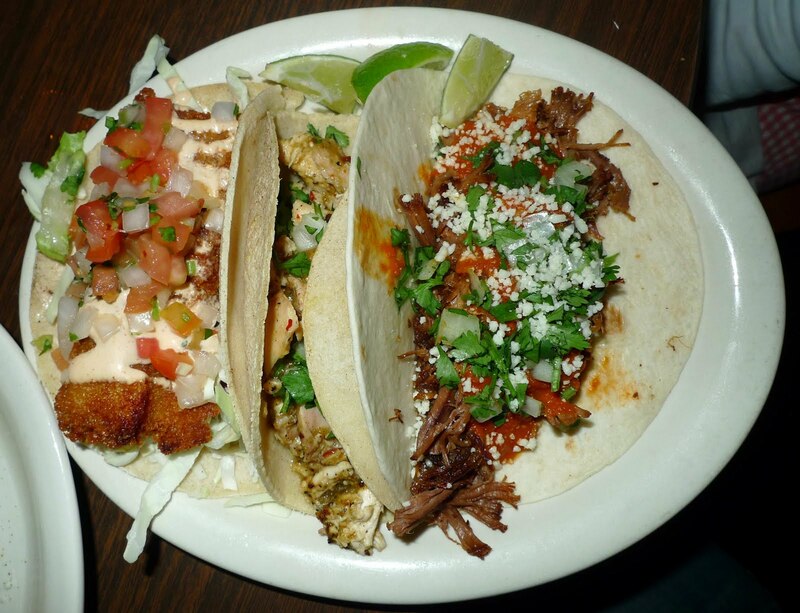 You order tacos individually – three tacos and a side fill me up, especially with all the munching on chips and salsa and queso and guacamole. Last time I went, I ordered a Baja fish taco, Chingona chicken taco, and brisket taco. They’re my favorites. The Baja fish taco was the biggest of the bunch, with big hunks of beer-battered mahi, cabbage, pico, chipotle crema, and cilantro stuffed into a homemade corn tortilla. The chingona chicken is tender, full of flavor, and slightly spicy from the tomatillo-chile de arbol salsa drizzled on top. And the brisket taco is rich and filling. 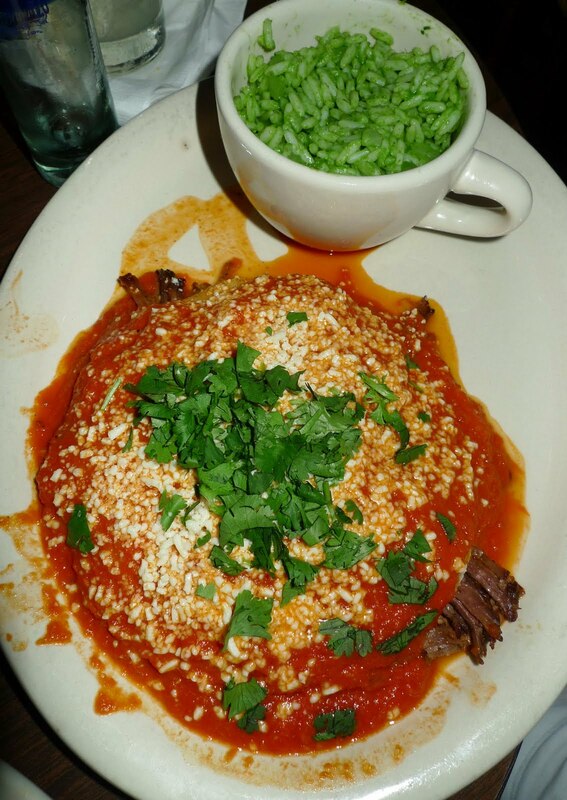 The beef is slow-roasted in Dos Equis Amber beer and served on a soft flour tortilla with homemade Ranchera sauce, poblano peppers, cotija cheese, diced onion and cilantro. Don’t forget to squeeze lime over everything. Phil’s Tacolu verde taco was a less spicy version of the Chingona chicken taco, but equally delicious. 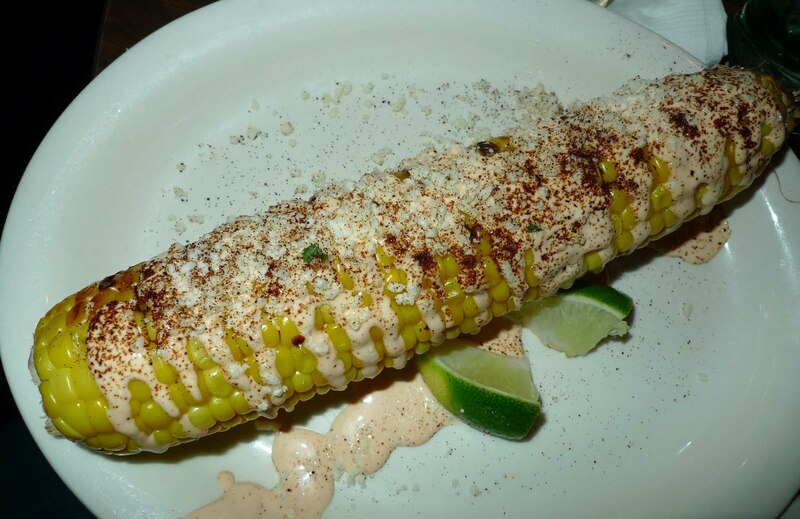 My favorite side is an ear of Mexican street corn. It’s topped with cotija cheese, chipotle crema, chile powder, and a squeeze of lime. I like that Tacolu exercises creative license with their taco fillings. While you won’t find a cheeseburger taco, lamb taco with feta sauce, or Asian-inspired bangin' shrimp taco in Baja, I really appreciate that the restaurant isn’t bound by a notion of authenticity. They like to have fun. So do I. Their enchiladas are also different from what we’re used to, cuz they’re stacked instead of rolled. I tried the enchilada roja the other day: freshly made corn tortillas layered with slow-roasted beef brisket smothered in homemade ranchera sauce and Mexican cheese. Mexican lasagna. Yum. My mom-in-law ordered it with cilantro-spinach rice. I was very happy to see the Aperol Skinny Margarita on the cocktail list. Tacolu’s Irene entered the drink in the Jacksonville Mixology Competition at Orsay a couple months back and took home the second place prize! Irene was very proud of the fact that the Skinny Margarita uses all natural ingredients, and I was just stoked that it tasted so fresh and clean and citrusy. The drink contains Corazon blanco, Aperol, organic cucumber liqueur, fresh-squeeze lime juice and agave nectar. The night I visited Tacolu there were some Cuervo promo girls passing around free shots of Cuervo silver. Si. Singleton's is a seafood shack of the highest order. 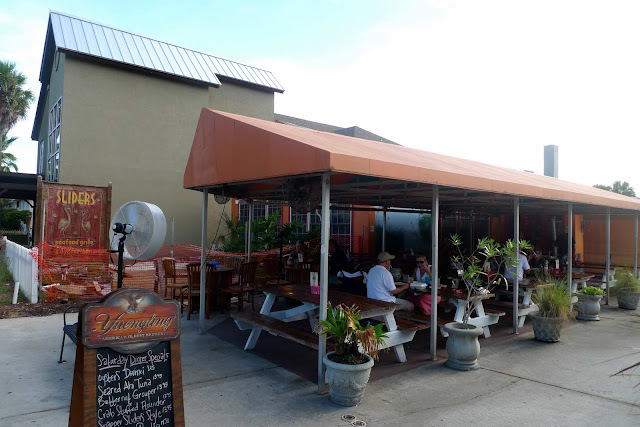 The eatery is in a rambling old wooden building right over the water on the Intracoastal, in the Mayport area of Atlantic Beach. It looks like it could fall into the water at any moment. That's why it's called a shack, I suppose. 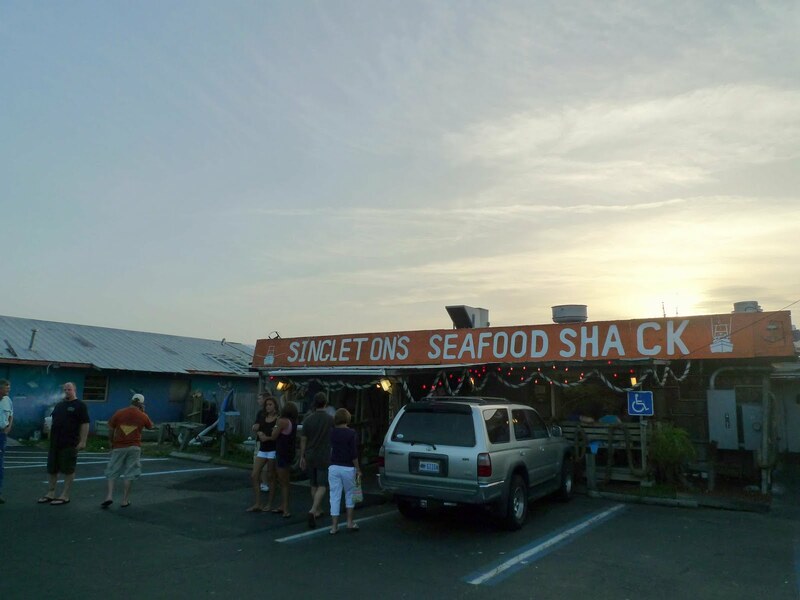 If the waterfront location and fishing boats parked in front of the restaurant aren't clues enough, you'll know exactly what you're getting into the minute you walk into Singleton's. There's a display of fresh seafood hanging out on ice right by the door, and the kitchen is immediately behind this display. You can watch the cooks grab a fillet of triggerfish, or sheepshead, or some crab legs, or a soft-shelled crab... turn around... and cook it. Right there. Pretty fresh. We went on Saturday night at prime dinner time and were told there would be a pretty sizeable wait, but our table was ready within twenty minutes. Perfect amount of time to walk around outside, take a stroll down the docks, admire the boats, take some sunset photos. Look at the wooden boat replicas and local art in the back room. Grab a beer at the bar. We were seated in the indoor area that's A/C'd, but honestly the temperature was no different inside than it was outside with the breeze coming off the water and all. Our waitress was exceedingly friendly and nice. I think I'd get sick of slinging the same fried seafood day after day, but she showed not a single sign of jadedness. 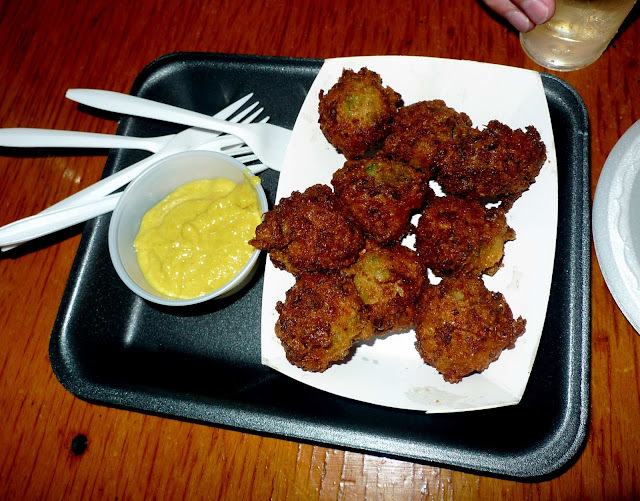 We started with conch fritters. Like everything else we ordered, they arrived hot hot hot to our table, fresh outta the fryer. I went with fried sheepshead (a local fish) and shrimp. Others at the table had Cajun-fried triggerfish, fried scallops, and grilled shrimp and triggerfish. I'm glad I tried the sheepshead since I’ve only seen it available here in Northeast Florida. But I definitely preferred the triggerfish, another local option - it's more meaty and moist and flaky. My favorite preparation was Cajun-fried so I'll get that next time! As far as sides are concerned - get the collards. They're well-seasoned and tasty. We also had fries, baked potatoes, rice and beans, and coleslaw floating around, and they were all pretty standard. Everything's served with plastic cutlery on Styrofoam plates. I wouldn't have it any other way. It seems that the right thing to do here is to get your seafood fried. 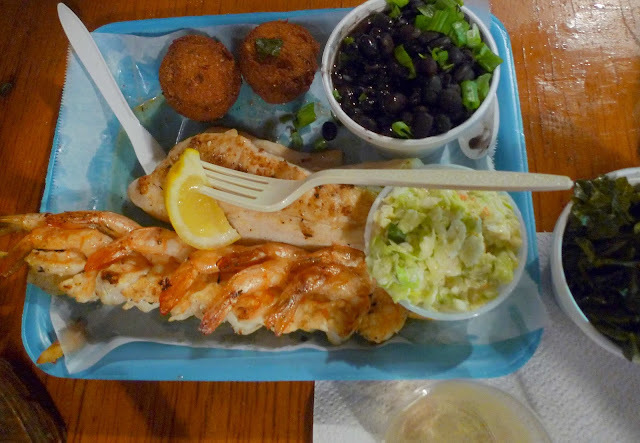 But my mother-in-law ordered her shrimp and triggerfish grilled and I actually preferred it that way. Bonus for my waistline! I don't think Singleton's is cheap necessarily - mains are pushing $20. But if you realize that you're getting enough food on one plate for three people, then you begin to see just how reasonably priced the food is here. We took enough food home for at least another meal. Singleton's makes me wish I grew up in Jacksonville. 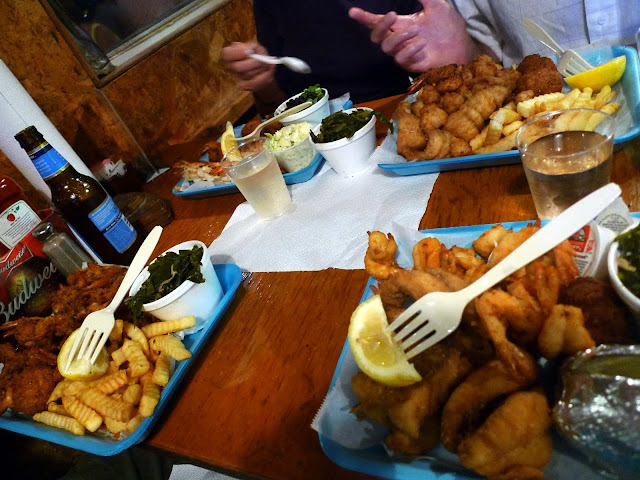 My husband grew up in Atlantic Beach and this is the food he ate when he was a kid. Now I understand why he was incredulous when I told him that I'd never eaten seafood before we met. There's no ocean in Ohio. Boy am I happy to live in Florida now. Don't listen to the reviews on Yelp and Urbanspoon telling you to steer clear of Singleton's. This place is what northeast Florida is all about. 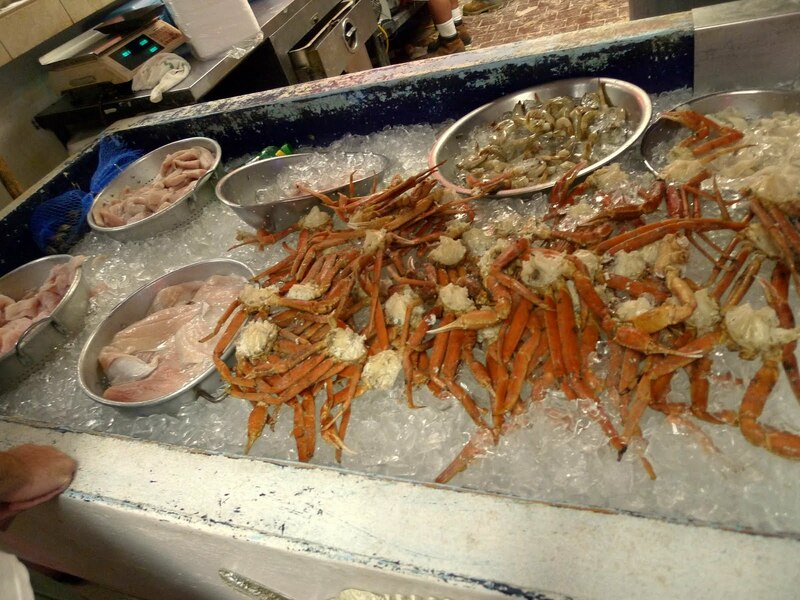 It’s a great example of our seafood culture and the casual atmosphere that permeates nearly all of our most-loved local eating establishments. 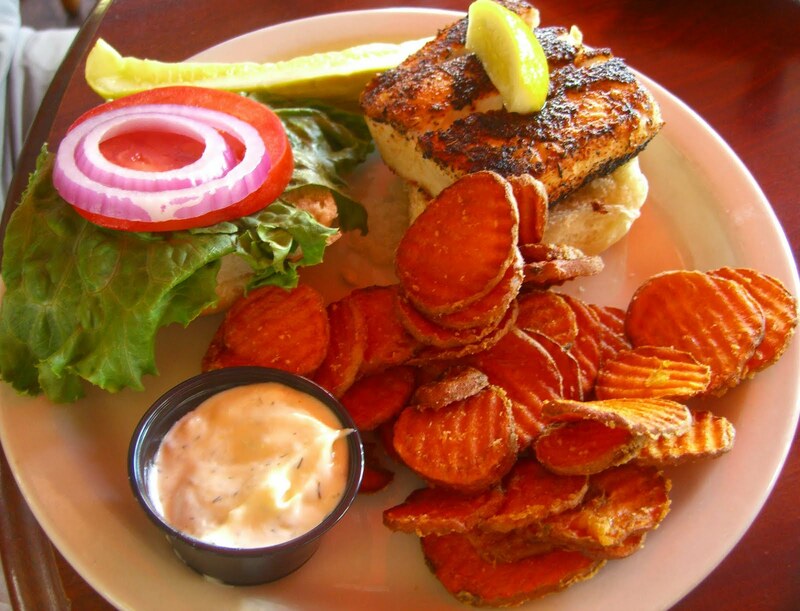 Any a self-respecting food snob will love this place - awesome views, lived-in feel, the freshest local catch imaginable paired with well-prepared regional favorites like hushpuppies and coleslaw and smoked fish dip? Local color at its finest. (Watch out for a future post covering more of Jacksonville’s fish camps.) 4728 Ocean Street, Atlantic Beach. (904) 246-4442. When I lived in Boston and came down to Jacksonville for Christmas or spring break to visit Phil’s family, the first place I wanted to go was Caribbee Key. With an upstairs bar open to the breezes of the ocean, affordable beers, and unmistakably Floridian fare, this eatery embodies the laid-back, casual surfer vibe of the beach. 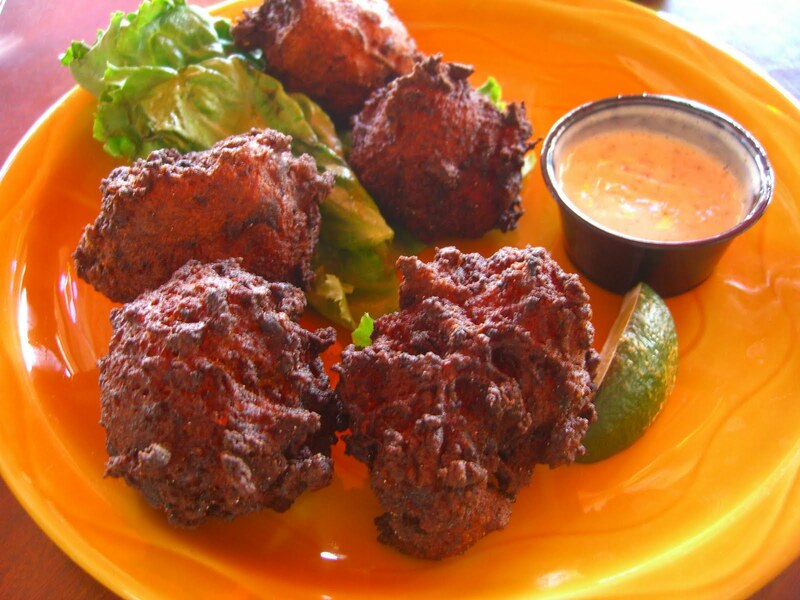 Their conch fritters are some of the best around - moist, well-browned, and always fresh and hot. 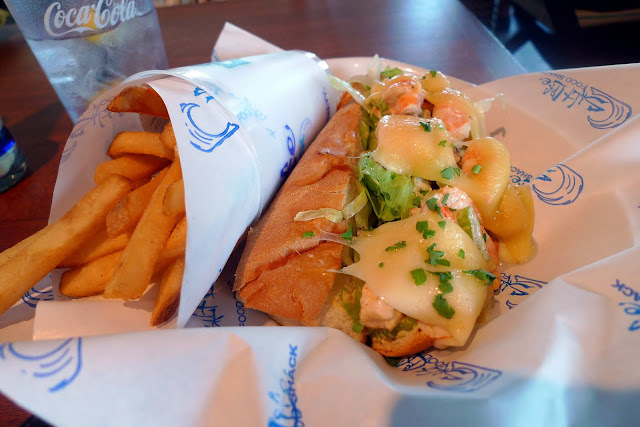 I had a cup of roasted corn and crab chowder once and was less impressed, but generally their seafood offerings are fresh, simply prepared, and filling. I can definitely recommend the sweet potato fries and the peel-n-eat Caribbee shrimp. Phil usually gets the Mahi2 sandwich, blackened. The place really gets bopping at night, when it becomes difficult to fight your way to the bar on the upstairs level. There’s often an island-y reggae type band playing downstairs, and a good mix of just-turned-21 and just-turned-30 folks. I only go out at the beach like twice a year, and it seems everyone who's out on the weekends comes through Caribbee Key for at least a drink. So, the place is definitely a fixture in my going-out-at-the-beach rotation. It's like a high-school reunion, only less awkward and only the cool people were invited. Know what you should drink at Caribbee Key? The Lemon Drop Martini. It’s the absolute perfect after-dinner drink. Kind of like a limoncello, only girlier cuz it's served in a martini glass with a cute little curly lemon peel. It's really strong - just one should do the trick. They'll make a "guy" version too, if you ask - all that means is that they put it in a plastic solo cup instead of a martini glass, and they skip the lemon peel. Casa Marina is a stunning colonial building situated right on the ocean. I think it must be the classiest spot in Jax Beach. A long walkway leads you over the dunes and drops you directly onto the sandy beach. The Casa Marina is a popular venue for intimate cool-weather weddings in the courtyard. I attended a wedding here and got to try the brunch buffet. It included many items from the regular Sunday brunch menu and a good mix of sweet and savory options. Most were quite good, but I can't say I'd be willing to spend $26.95 of my own money to have brunch here. To me, brunch just wouldn't be brunch without a mimosa or bloody Mary, so figure in the cost of tax, tip, and a drink and you're easily looking at $80 for brunch for two. Maybe for a special occasion. But maybe not. What I can recommend without hesitation are the unparalleled ocean views from the Penthouse Lounge on the top floor. Enter through the side of the Casa Marina and wind your way up some gorgeous wooden stairs to the top floor. When you reach the lounge, the first thing you'll see is a very cool wooden bar lit by pendant lamps dangling from the ceiling. The main lounge area is straight ahead. It's a circular room with floor-to-ceiling windows on nearly all sides so you have an amazing ocean view from almost every single inside table. It was drizzling so we didn't sit outside. However, most of the outdoor deck is covered by a permanent tent so it really wouldn't have been a problem for us to sit under the tent. Also great for providing shade from the sun! The lounge has an extensive cocktail menu with tasty-sounding martinis like a blueberry lemon drop, bikinitini, and Caribbean cosmo. Girls get specials on the drinks every Friday. Our waitress was extremely friendly and recommended a key lime martini that wasn't listed on the menu - she had the bartender make it especially for our table. It was frothy and creamy and tasted just like key lime pie. We also ordered bleu chips and crab cakes. 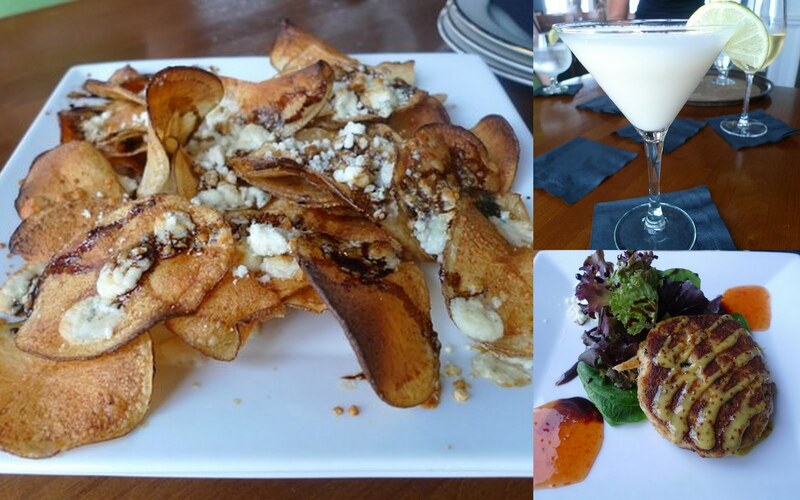 The bleu chips are housemade potato chips topped with warm crumbled bleu cheese and a rich rosemary balsamic reduction. 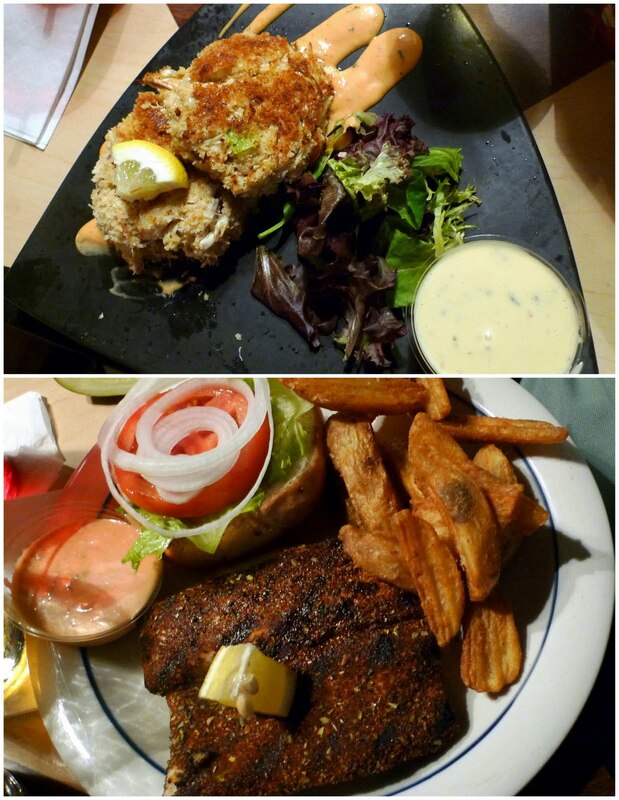 And the crab cake was crisp and full of crab and came with two sauces: whole grain mustard and sweet chili. Sun Dog is one of the signature restaurants found in the Neptune Beach/Atlantic Beach Town Center. 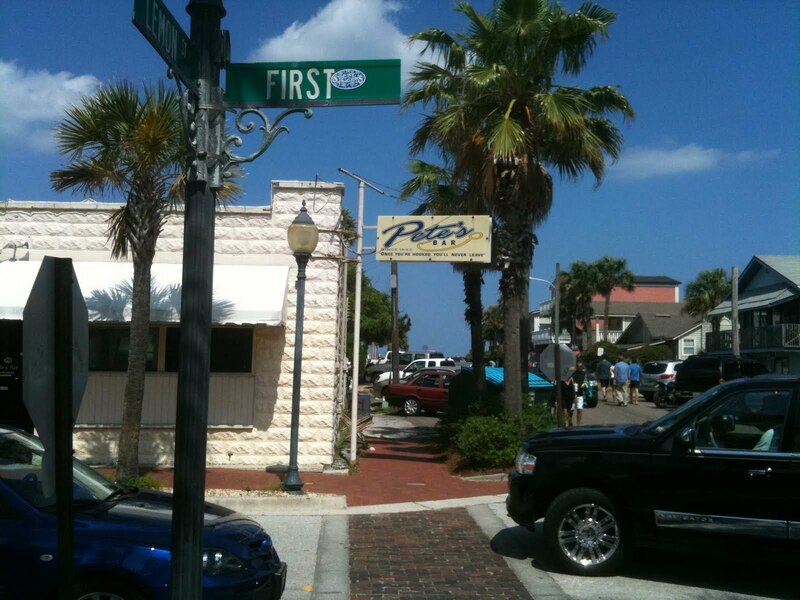 The casual menu, service and atmosphere have been satisfying the tastes of beach locals for generations. Many people come into Sun Dog straight from the beach with sunburnt necks and sandy flip flops. 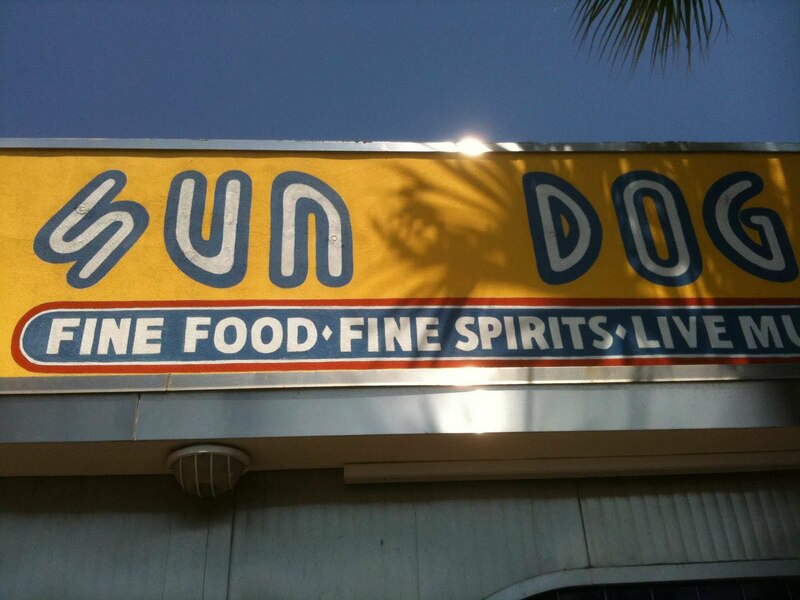 The first thing you do when you get to Sun Dog is order is a beer. They have Bold City on tap. Go for it. This diner prides itself on being unpretentious and the bar can get pretty rowdy as the night goes on, especially on the weekends. 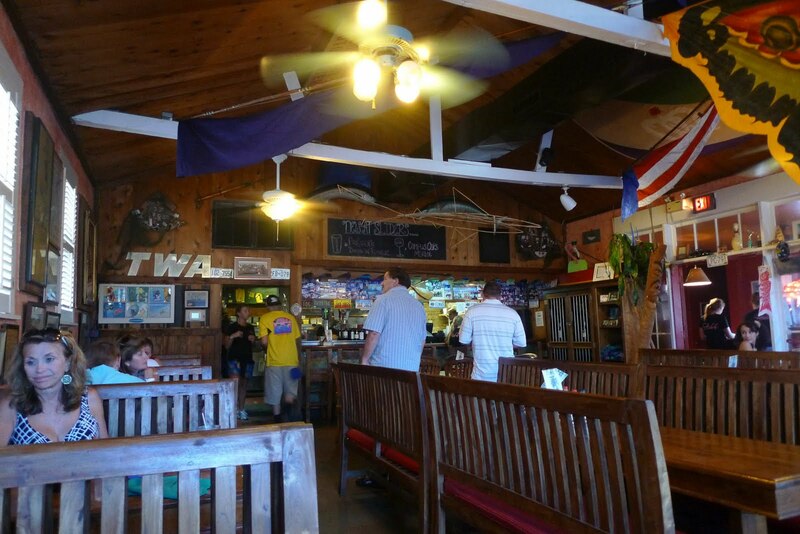 They often have a variety of live music going in the corner, and the crowd is typically a bit older than some of the other bars at the beach. 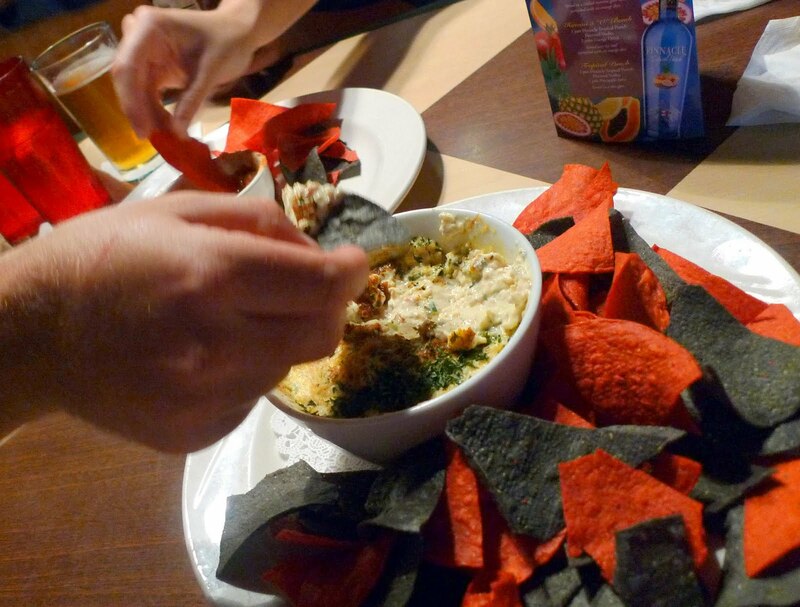 We started off with chips and salsa and some of their delicious lobster parmesan dip. The salsa was fresh and the dip was definitely the best dish of the night - rich and full of lobster and really an enormous portion for the price. It easily served as an appetizer for all seven of us. Too bad the tortilla chips were REALLY stale. Someone in the group had a hankering for fried shrimp but they were out of shrimp (?!) so here's what we ordered: crab cakes, crab cake sandwich with fries, blackened mahi sandwich with fries, ahi tuna provencal salad, chili, blackened mahi with bleu cheese, and scallops with pineapple salsa and spinach. The mahi and scallop entrees also looked really good but I'm not sure I'm down with paying nearly $20 for a main dish at a diner. I could pay that and get something way better somewhere else. 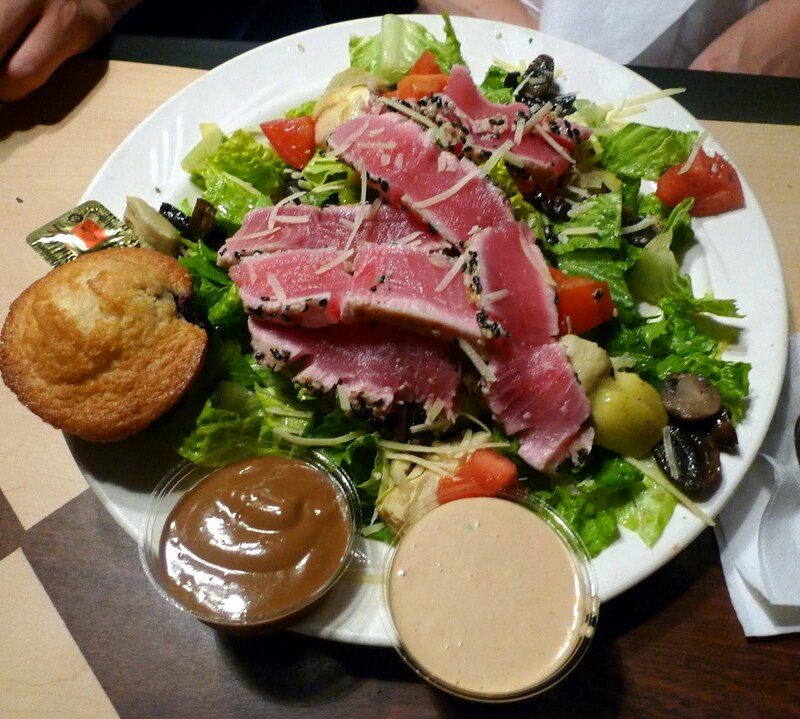 The best dish was the ahi tuna salad, and I thought it was fairly priced at $10. 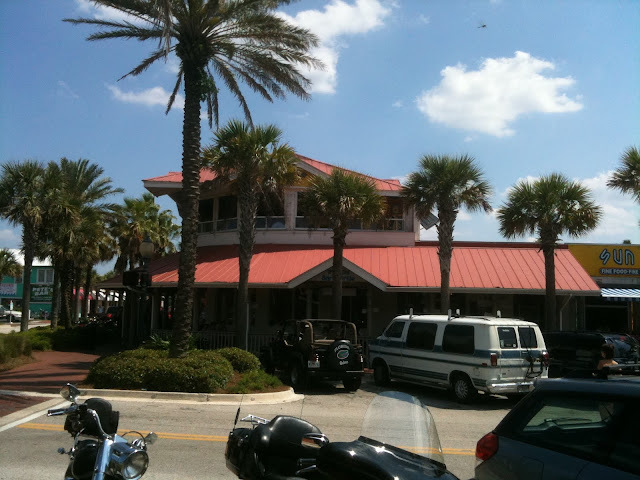 Sliders is a Neptune Beach staple. The eatery has been serving casual but quality seafood for, like, ever... and should continue to do so for years to come. There's seating both indoors and out and the place is normally the busiest in the late afternoon to early evening, when folks come stumbling inland from the beach. Up until last week, I only ever went straight for the advertised specialty: oysters. Raw, steamed, casino, whatever, they're delicious and if they're in season, they can be earth-shattering. Get ‘em steamed and you get to shuck ‘em yourself. Play with your food! Come on, it’s fun! 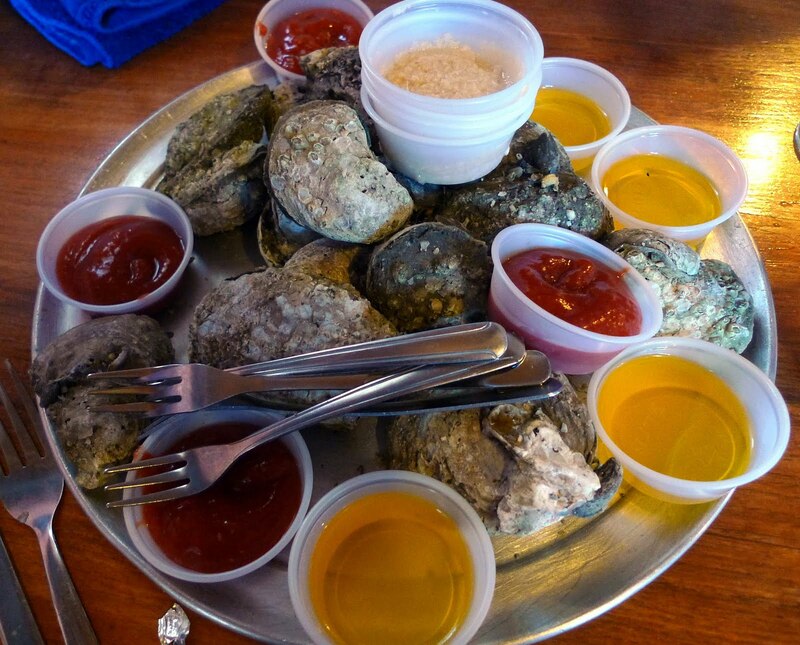 So last week I went with Phil and the in-laws and we all went for non-oyster entrees. First time ever! Plus… we sat inside. First time ever? We started with smoked fish dip. It was aight. Not as good as Chowder Ted’s (you need to go there, by the way). 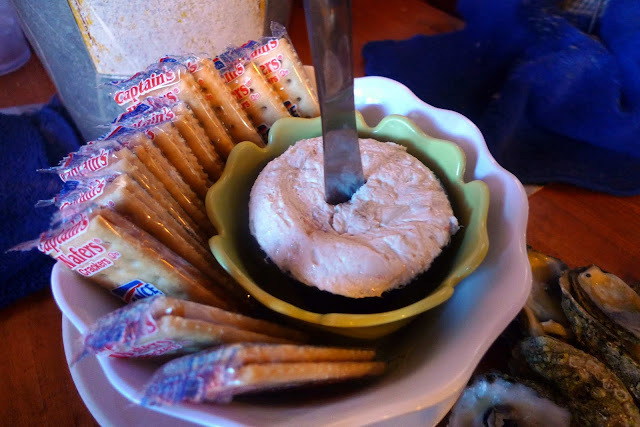 It needed a bit more time sitting at room temperature to make it easier to spread, and there weren’t any hunks of fish in it, just lots of shreds mixed with cream cheese and some spices. 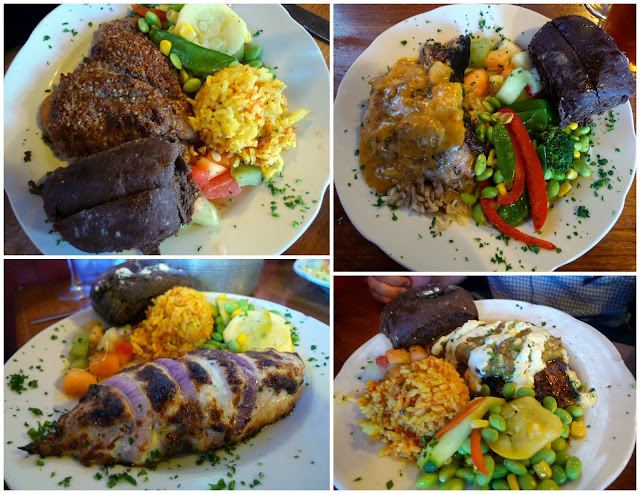 Then we got: blackened cobia topped with fresh tomatillo salsa verde and a Southwest corn aioli; grilled jerk marinated wahoo over coconut rice and topped with Island red curry sauce; and grouper baked with a crust of herb-seasoned breadcrumbs and buttered pecans. All entrees came with the same tasty veggie medley of edamame, red bell peppers, snow peas, zucchini, carrots and corn. All the plates look the same. Yeah. You get the idea, though. 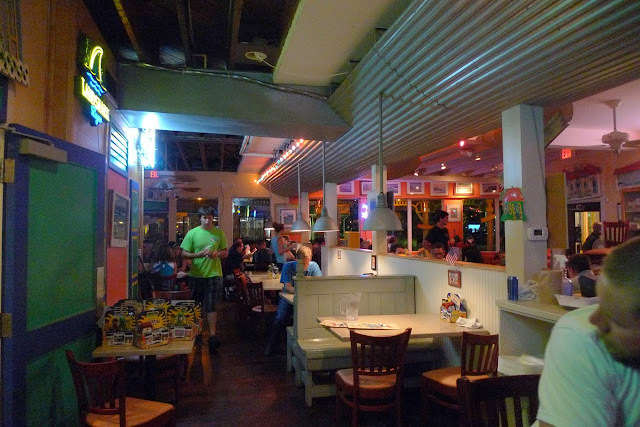 The atmosphere at Slider's is a huge part of the restaurant's appeal. It's right across from Pete's Bar, so combine the two experiences and you'll get a pretty massive - if not overwhelming - dose of beaches local color. Sometimes it's too much for a townie such as myself to handle. 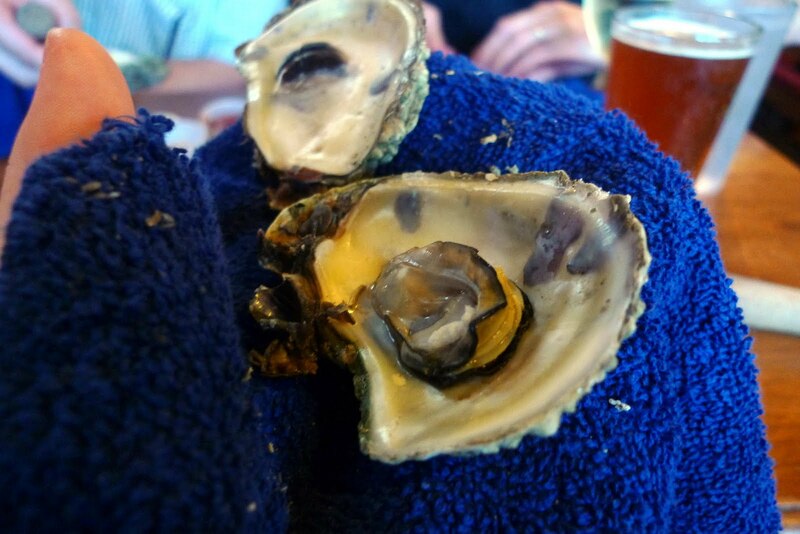 But slurping down some oysters at a picnic table outside is a pretty awesome way to sample a way of life that us townies often dream of - surf, sand, sun, no shirts, no shoes, no problems, bro. 218 1st Street, Neptune Beach. (904) 246-0881. I first went to Pete's about a decade ago, when Phil and I started dating and I came to visit his family for the first time. The in-laws have been going for a decade longer than that. It would seem that not a lot has changed with Pete's during my lifetime - and that's exactly how I like it. 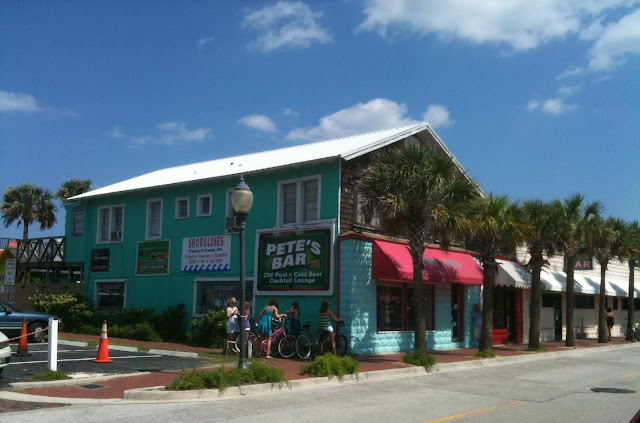 The place that Pete's holds in the hearts and minds of beach locals is virtually unmatched by any other establishment. The laid-back clientele you'll encounter on nearly every night at the bar offers perhaps the best example of the state of mind and lifestyle that characterize life at the beach... a combination of Southern attitude and surf-n-sun casualness that has defined the Neptune/Atlantic beach neighborhood for years. Beer and/or dark liquor drinks are generally the norm. Fruity cocktails imbibed by men or women will earn suspicious glares from the regulars. My mother-in-law certainly betrayed herself as an inexperienced patron when she asked for details about the "house red" - oops. Don’t do that. 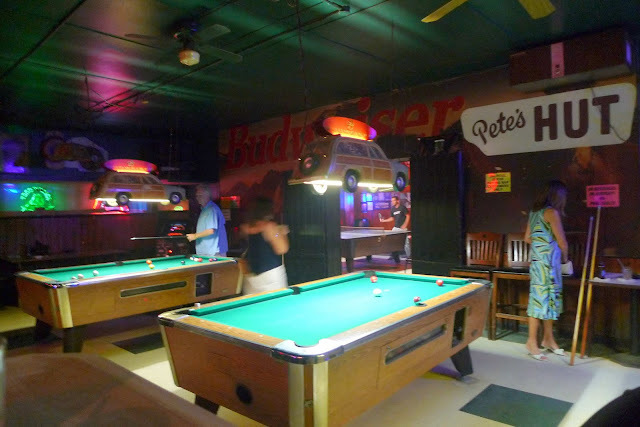 Besides being the local dive bar for casual drinks, Pete's is also the most popular pool hall at the beach. 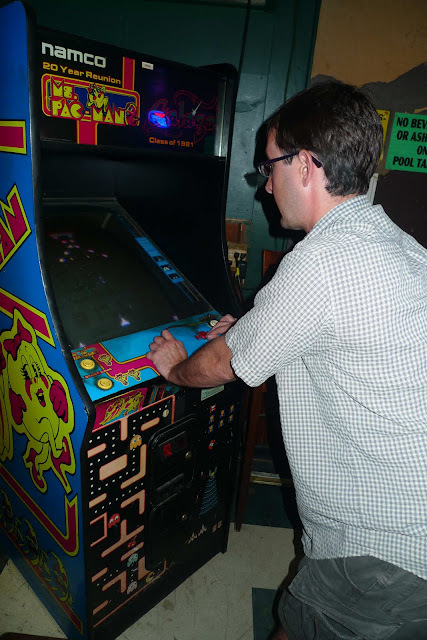 At a practically prehistoric 25 cents per game, the bar attracts some extremely enthusiastic competition, and each table holds its own unique history for those who've been playing for years. 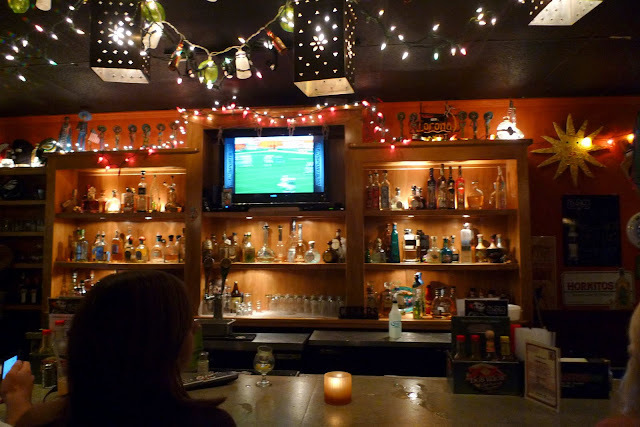 The bar also has a ping-pong table and a foosball table spread out over the bar's three main rooms, so the atmosphere is one of friendly interaction where strangers or dates have a natural way to get to know each other. Oh, and there’s also the Galaga arcade game. Try not to let your date see that if you want him to pay any attention to you for the rest of the night. 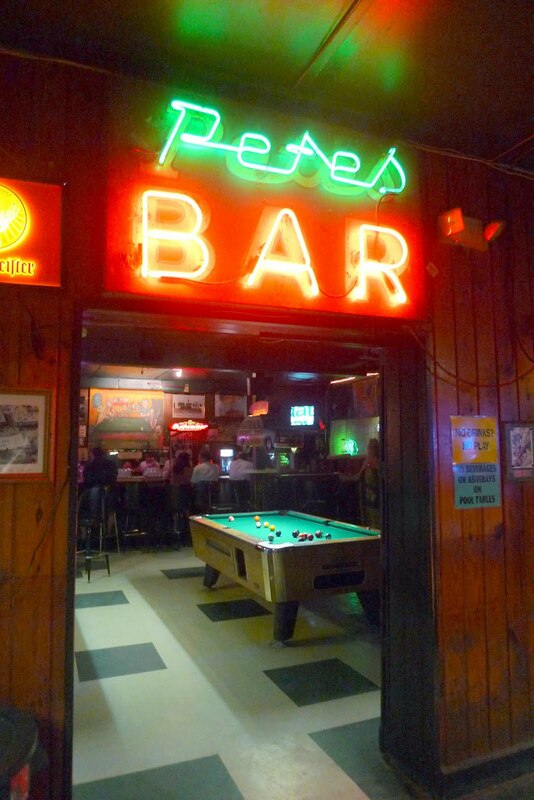 The mystique and history of the bar have attracted the attention of several noteworthy men and women, including John Grisham who made Pete's a vital setting in his novel "The Bretheren." I think Hemingway hung around once or twice, too. Check out the history page of their website for some interesting Prohibition-era stories. The Lemon Bar offers a glimpse into everything that is good about life in Jacksonville's beaches. 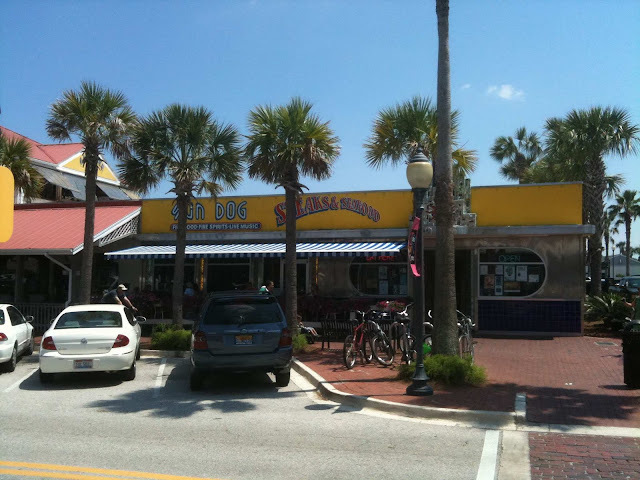 Located on the beach in the nexus of the Atlantic Beach-Neptune Beach town center, The Lemon Bar offers a drinking experience like few others in the area. Because it's closed during the winter months, the seasonal opening of the Lemon Bar really gets you excited about the arrival of warmer weather. The excitement fades rather quickly as “warmer” weather turns into scorchingly-hot-and-humid weather, but at least you have some ocean breezes and big umbrellas to shade the sun at Lemon Bar. The bar itself is extensive and stocked with just about everything you would expect... so no surprises there. It's the atmosphere that makes The Lemon Bar so special. Grab a seat on the back patio area with a cocktail and take in the seaside view. There are not many bars that afford such a stunning view of the sea dunes and manage to achieve a balance between both beachy casual and dressy chic. You can wear your cover-up, or you can wear heels, and you'll be appropriately dressed either way. There's a nice mix of locals and tourists with a common desire to have a laid-back time on the First Coast. 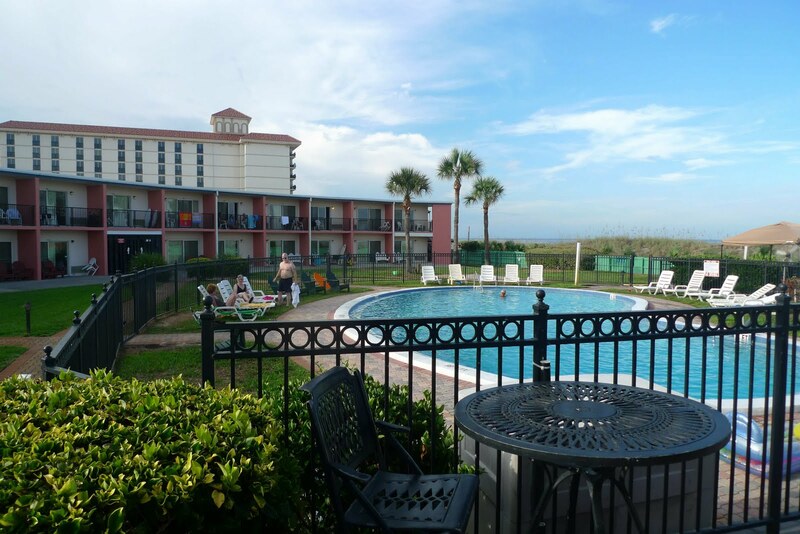 The bar is part of the Seahorse Oceanfront Inn, so if you’re visiting from out of town you might want to consider this extremely affordable beachfront option. 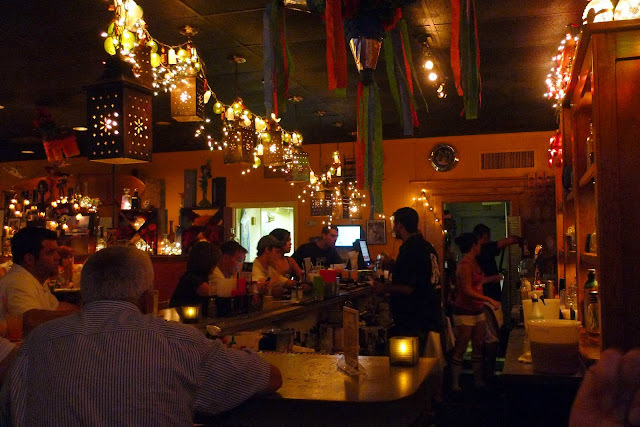 Fly's Tie is the most charming bar in Atlantic Beach. It's well off the beaten path on Sailfish Drive, about a mile from the ocean… away from all those popular drunken beachy spots. Fly's Tie is an Irish pub and it manages a much more authentic feel than most of the other bars that bill themselves in similar ways. The inside is quite small with a comfortable capacity of perhaps, oh, 30 people. There are dart boards and a stage - open mike night has been a popular event with locals for years. Al’s may be a local chain, but I’ve been to this one on the beach more than any of the others. It’s light-filled, casual, airy, and affordable. Servers are young and tan with big smiles and bubbly personalities. It's been a local staple for awhile but the reputation seems to have declined in recent years. Not sure why, though. I mean, it is what it is. It's still a go-to spot for my friends who live out at the beach and we often grab lunch there on the weekends if I'm out thataway. 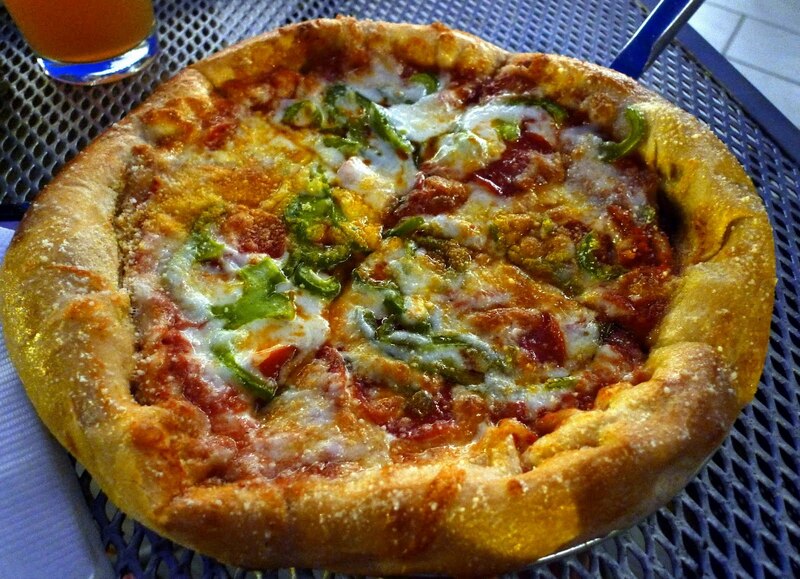 Al's serves up pretty standard pizzas and pastas and subs and Italian-American entrees. I quite like the tomato sauce they serve on pastas and dishes like the eggplant parm. It's bright and tangy and you can tell they haven't cooked the tomatoes to death. And, there's something about that house salad at Al's. Nothing special, really, just lettuce, tomatoes, red onions, shredded carrots and cabbage, and mozzarella cheese. 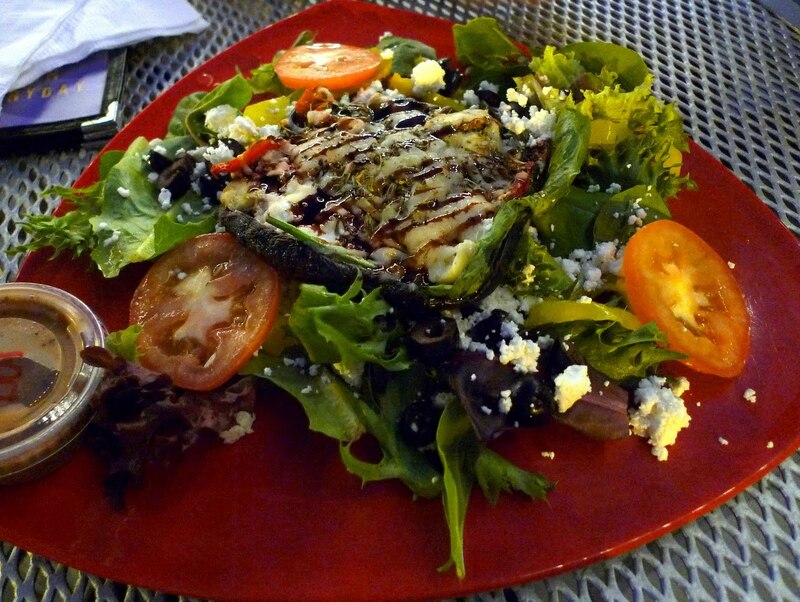 But the ingredients are always fresh and well-proportioned and the mozzarella is grated in-house. Well, there you have it. My go-to beach spots. It’s not a comprehensive list of beach eateries and bars, and there are some fancy places that I’ve had on my wish list since I moved here in December: Dwight’s Bistro, Azurea at One Ocean, and 11 South… plus newcomers The Brasserie and Engine 15 Brewing Company. And keep an eye out in November for Nipper’s, a restaurant owned by none other than Top Chef season seven’s Kenny Gilbert! Tee hee:) There were some hotties there! You should definitely check out Culhane's Irish Pub, in a strip mall right before One Ocean....amazing Guiness Beef Stew and Dingle Fish Pie! 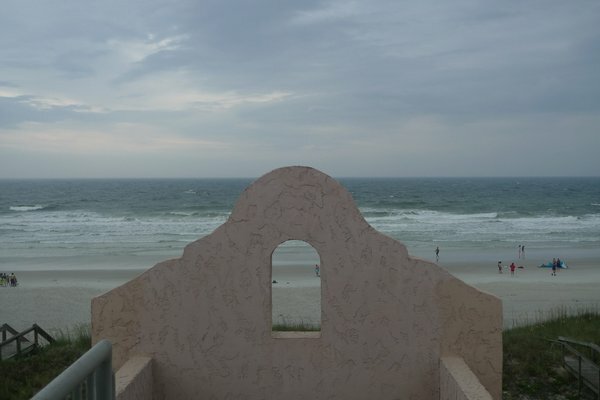 I also think you should go to Ponte Vedra Beach, there are several great places there! I definitely enjoy reading your reviews of some of my favorites and others I haven't gotten to yet! @Meagan - I love Culhane's! Didn't have any photos so decided not to mention it in this post, but I certainly will in the future. Haven't had their Dingle Fish Pie, so thanks for the recommendation! You're right - still need to explore more of the eateries in Ponte Vedra Beach. My husband grew up in Atlantic Beach so I'm definitely more familiar with Atl, Neptune, and Jax beaches... thanks for the visit!! Okay, let me get this out of the way — I LOVE your blog! I was googling JAX farmer's markets and came across your blog. I've been wandering around here for about an hour and finally had to get up and go get a cloth to clean up the drool. I'm moving to Jacksonville at the end of the month and while I was already excited, I'm even more so now thanks to you. I've added you to my blogroll and trust me, one I'm settled in, I will be back for your recommendations. First up? 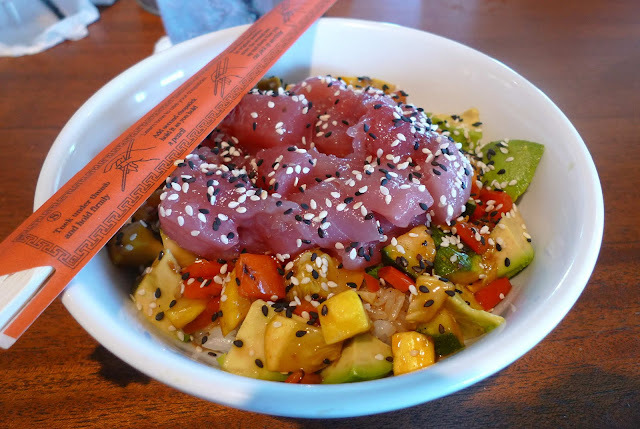 The Hawaiian Ahi Bowl at Salt Life. Hmmm…maybe I should move sooner. Thank you so much for mentioning Pete's. Pete and Clara Jensen were my great aunt and uncle. Most of my memories of Pete's are from when I was really young, but after Uncle Pete died. I would ride my bike up there to see Clara (during the day) and walk in like I owned the place. Must have looked pretty funny to all the regulars at the bar. I decided to stop lurking and comment on this particular post because after reading it I went to Salt Life and ordered the Hawaiian Shrimp Bowl. I substituted ahi tuna for the shrimp, per your friend's recommendation. Wow...what a great dinner! I've had the poke bowl before and loved that, too. This was my third visit to Salt Life and, like you, I really didn't want to like it. But at this point, I have to say, I think I'm in love. @Andie - you're too sweet! Wish I had more time to blog - so many food and travel stories I'd like to share, but only so much time. Salt Life is just the bomb, isn't it?! A definite Jax gem. Don't be a lurker - I'd love to hear your thoughts on past or future posts!!! 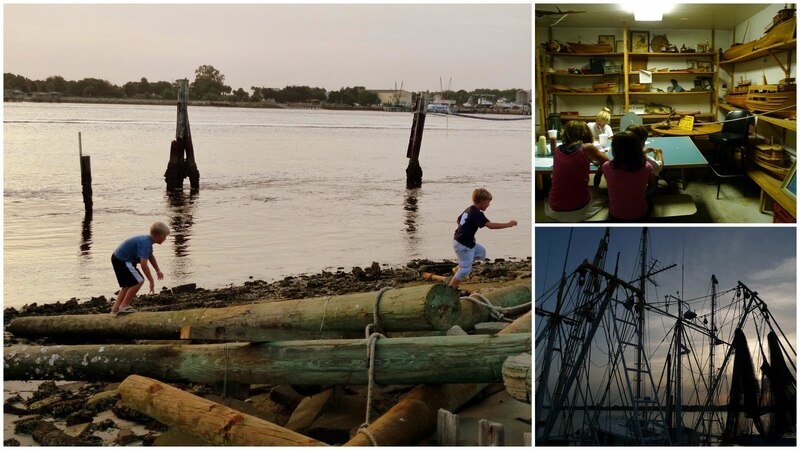 Wow - experiences listed here are a bit different from what I've seen/heard about Salt Life! Great ambience and lots of energy, but as far as the food goes - there a lot to be desired. To each his/her own I guess ;) I also did not try to Poke dish and the photos look well portioned, I wonder if they all look like that? Anyhow, great blog. 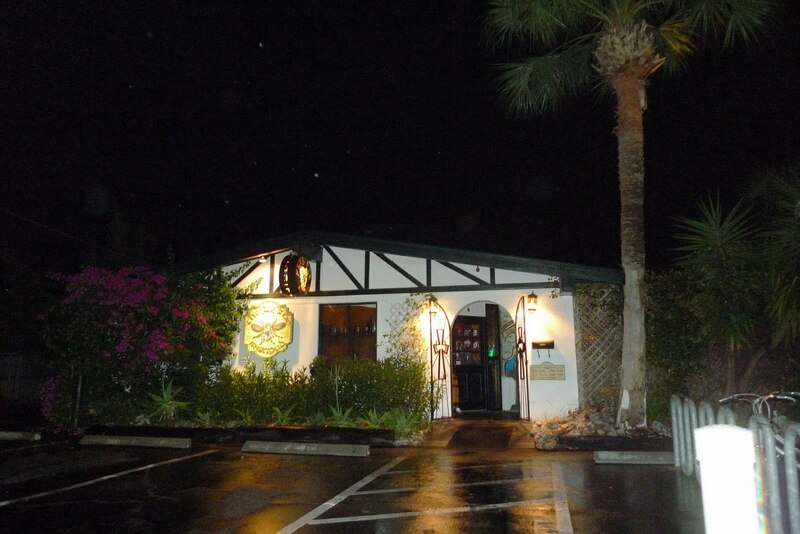 You should take a trip further south on A1A and check out Pusser's Caribbean Grille sometime, there is a surf and turf dinner special every Tues. night - PVb locals know about this gem. You won't be disappointed! Hey this is an awesome review I love that there are pictures and things. Great stuff I'm trying every place on here I haven't already tried. Thanks. Got here through Urbanspoon. Great post-you should def try Azurea, skip Dwight's and 11 South is decent. I don't get the Al's fixation with the local's-not anywhere close to Italian food!